Media caption"It might not be the stuff of sound bites, but I've always believed in... empowering others." Jeremy Corbyn has defended his style of leadership, saying other party leaders had given in to vested interests and manipulated the public. The Labour leader told supporters Prime Minister Theresa May was developing a "presidential bunker mentality". Mr Corbyn said he believes in "empowering others to make up their minds" instead. He also used the speech to urge young people to vote, saying apathy would hand seats to the Conservatives. 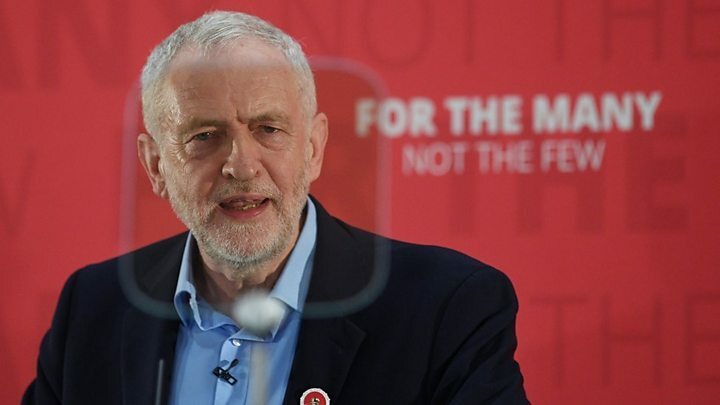 In what has been described as his most personal speech of the election campaign, he said that "if leaders go unchallenged, they can make some of the most damaging mistakes". "If party leaders put themselves ahead of serving the people, they stop listening and even put our country at risk," he told supporters in East London. "Barely nine months into Theresa May's premiership, there are clear warning signs that she and her closest advisers are slipping into that presidential bunker mentality. "Whereas it is the job of leadership to hold open the space for dissent, new thinking and fit-for-purpose policy. "So while it might not be the stuff of sound bites, I have always believed in standing firm and empowering others to make up their minds and come on board when they are ready." Mr Corbyn said while political leaders had to give in to "vested interests", he did not want to be like that. "It wasn't clear to me there could be another way," he said. "But I've learned there is. Whereas insecure leaders want to feel stronger by asking you to give them more power, I recognise strong leadership as equipping you with more power." The Islington North MP said it was vital young people register to vote, telling them they should "step up" and "claim the future". He said 2.4 million people are missing from the UK's electoral register and pointed out that barely 40% of 18-24 year olds vote, adding that Conservatives are more than happy with this and "apathy and resignation" will secure them seats in the election. Asked if it would be a bad performance for the party if they do not win, and if he does not become prime minister, he replied: "I'm going all over the country, and you know what? - the printed papers say one thing but the mood on the street tells me something very, very different. "There's a positive energy and a positive anger out there. "People are fed up - they are fed up with not being able to get somewhere to live, they are fed up with waiting for hospital appointments, they are fed up with zero hours contracts, they are fed up with low pay, they are fed up with debt, they are fed up with not being able to get on in their lives because of a system that's rigged against them." He used the speech to highlight his political career, including his activism against apartheid in South Africa and in support of Nelson Mandela in the 1980s. He also referred to his maiden speech in 1983, when he criticised Tory cuts to public services, and said it was a "tragedy" that such a speech would hold true today. Actress Maxine Peake was among those in the audience for Saturday's speech. In response to Mr Corbyn's comments, Conservative Party chairman Sir Patrick McLoughlin said: "Jeremy Corbyn can promise anything but we all know he can't deliver. His nonsensical speech today demonstrated that he is just not up to it." His speech comes as Mrs May spoke in Scotland in her first campaign visit there, asking Scots to vote for her to "strengthen the Union". Meanwhile, the Lib Dem's Tim Farron has said he wants to become the leader of the opposition when the UK goes to the polls on 8 June.